Here's my interpretation of the OUAS Feb sketch and the challenge is Totally addicted to... My answer as seen clearly would be BLACK. I was not crazy about black in my younger days but now most of my stuff are in black. The journaling consists of stickers from October Afternoon, the long sticker reads "People seem to get nostalgic about a lot of things they weren't so crazy about the first time round." I had used a family photo printed in black and white and did some inking over the photo background. The original photo had a light gray background and so I inked and made patches to make the photo less stark in gray. There is also a local challenge on Facebook group called Moments Recorded challenge hosted by Sophia Soh this month. The theme is Monotone Me. 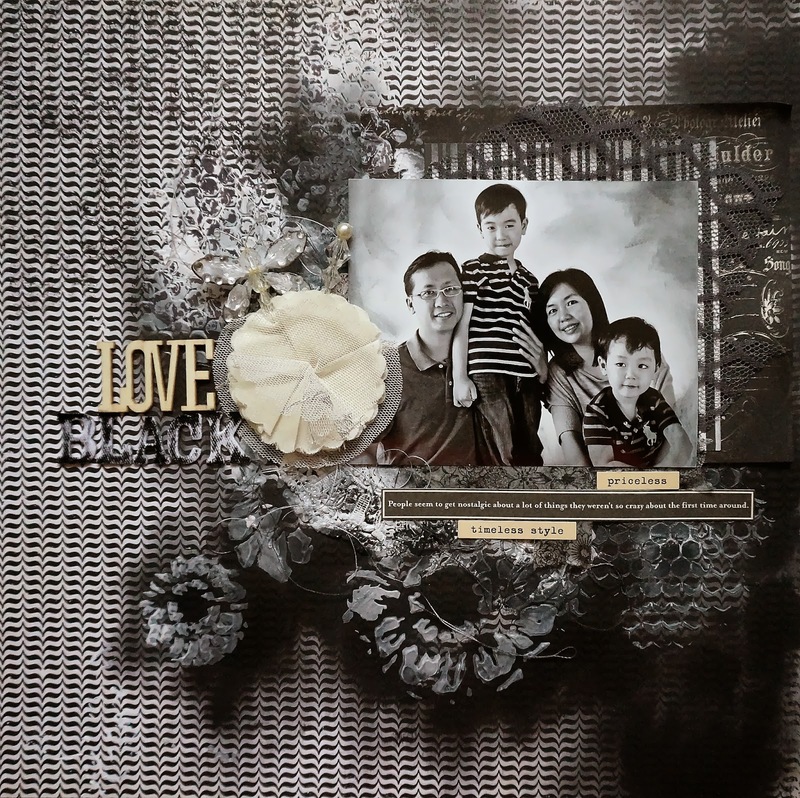 I chose Black and White and 2 other additional criteria journalling and Lace. I got black inky crazy this round. There is some cream popping off the page while the white is not entirely white but off white. There is lace stamping on the honeycomb which is not very obvious and there is some lace tucked behind the flower and photo too. Had fun creating this one and I had my fingers in black soot as I scrapped this piece after #1 went to school while I'm waiting to get ready to go to work. Now that my life is kind of changed stealing time to scrapping in the morning before going to work. Less night scrapping these days! GORGEOUS!!! Love the black! My fave color!!! I would never have guessed you liked black and white Mich... :D This is a lovely layout I love that lace and the flowers. Great quote too. Thanks so much for playing along with us at OUAS this month :D Please load your layout onto our OUAS FB page for another chance to win.